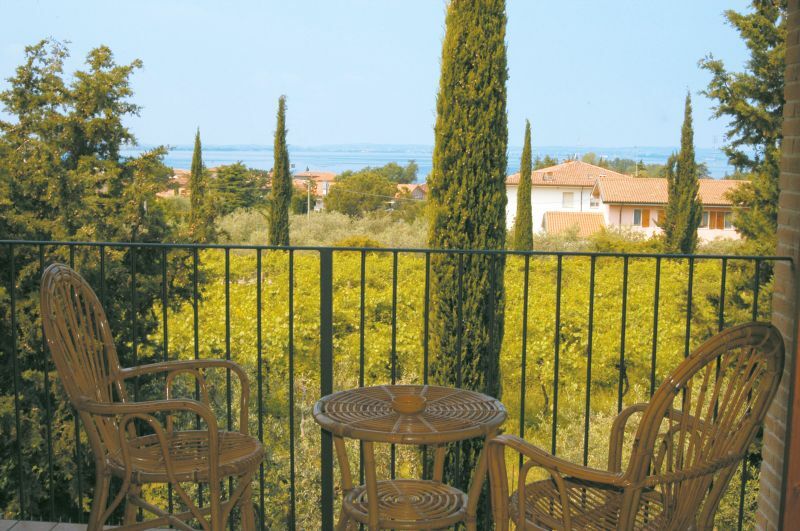 Immersed in the verdant countryside, just a short distance from Lake Garda, Relais agli Olivi is an ideal retreat for people looking for serene and peaceful hospitality, in an exclusive setting. The small number of guest rooms and limited private spaces available ensure guests exceptional service in a sea of tranquility. During the stay, you can take a swim in the pool and benefit from the whirlpool, relax on a lounge chair or under the umbrella in the solarium, stroll in the expansive, immaculate gardens and admire the glorious landscape of the lake and the surrounding hills or stay in shape in our fully-furnished fitness center. The Relais agli Olivi is tucked into the gentle hills, surrounded by olive groves, in a truly spectacular location. It is hosted in a country-style building, with large porches on the ground floor and scenic terraces on the first floor. Relais agli Olivi offers its guests exceptional services in a familiar setting. 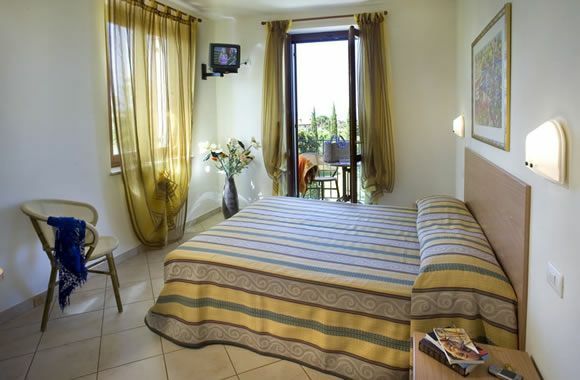 The completely renovated rooms guarantee superior tranquility and comfort. 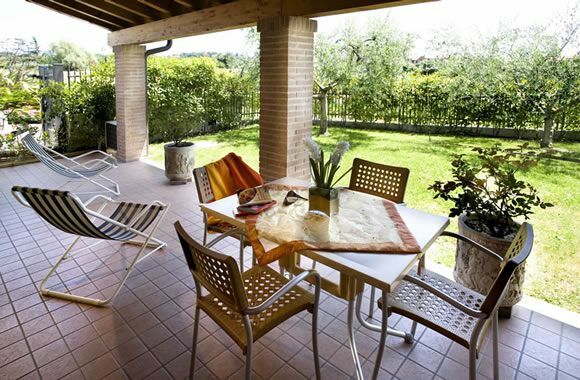 The large terrace affords a breathtaking view of the lake and the characteristic surrounding hills. Our guest rooms boast every luxury, including en suite bathroom and shower, independent air conditioning and heating, refrigerator, hair dryer, Telephone, Wi-fi, satellite television, room safe, and either a terrace or a private patio. The hotel also has a swimming pool with whirlpool bath, internet point, gymnasium, garden, private covered parking area and bicycle storage and rent free. 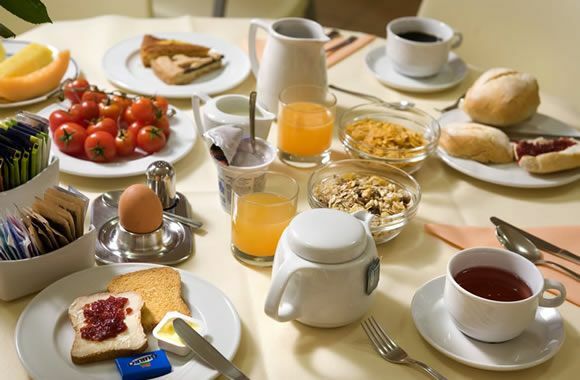 Rates are quoted per day in a double room, including buffet breakfast, service and taxes. Children under two stay for free in their parents' room. Possibility cots for children under two. Possibility extra bed in the room. The rooms with balcony or terrace, bathroom-shower and WC, hair-drier, SAT TV color, air conditioning, heating, safe in room, internet point, swimming-pool, gymnasium, garden, private parking covered and bicycle storage. 75% of the total price of the stay for cancellations made in the three days prior to arrival, with at least one night's stay. Security deposits will be credited to the partial or total payment of the above penalties. To make a reservation it is required a deposit, pay in the current account or it is required the details of a credit card, as a guarantee. On concluding a reservation, it is required a written confirmation by fax or e-mail, specifying dates and price. We accept cash, personal cheques, POS payments, and credit cards (Visa, Mastercard). If the payment in cash is at Check-in, you grant a discount of 3% on our standard list prices. This reduction is not recognized, when in some periods are ongoing promotions, last minute or the offer at prices already reduced. We are at your disposal for any further assistance you may require. Check-in: from 14:00 pm to 7:00 pm. Check-out: from 8:00 am to 10:30 am. If you will be arriving after 7:00 pm, please advise us by phone +39 045-758-0675 . The entire booked stay will be charged even in the event of delayed arrivals or early departures.